Now, The Grinch starts off with our beloved Grinch having a comedic encounter with his alarm, and is shown seeming to have trouble waking up. Despite this though, he has an extensive wake up routine that he is seen following every day as the movie progresses. In this wake up routine, we also get an earful of The Grinch soundtrack, but remixed to fit the current hip hop trend, with Tyler The Creator starring in the melody. A little after some of the Grinch’s shenanigans, we are introduced to what seems to be our new main character, a Who mom who has trouble keeping up with her children whilst keeping the family afloat. But turns out it is actually the daughter of this mother that is the main character, a Who whose only Christmas wish is to make her mom happy. 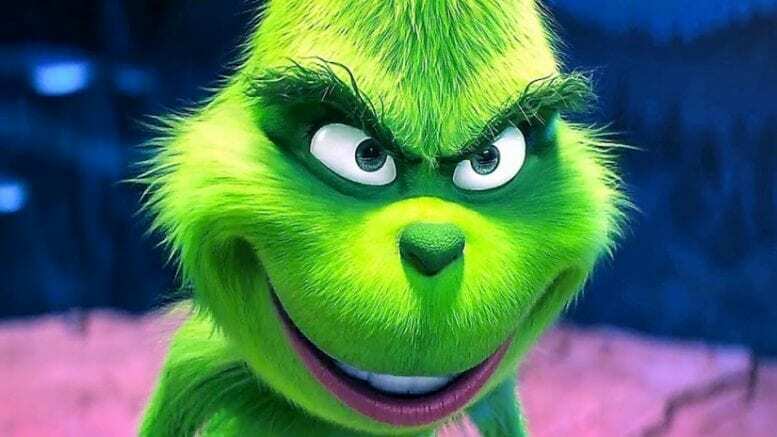 Now that you know the base of the plot, let’s skip ahead a little bit, past a lot of the filler the Grinch does to extend the movie, such as: the Grinch contemplating his life, the Grinch having a flashback to his childhood, when he was put in an orphanage that didn’t have anyone in it to give him presents for some reason, and the Who girl meeting up with her friends to plan to ‘capture Santa’ to tell him about her mom. Ok, so, we’ve skipped past the non-relevant part of the story, now we get to the REAL part of the movie, were a joyful Who flies past the Grinch’s mountain in a plane carrying a giant Christmas tree that, when covered with lights, would be the biggest and best Christmas tree that Whoville had ever seen. As the Who flies down towards Whoville, the giant tree rustling its pines, the Grinch has finally had enough. We are now about halfway through the movie, and we watch as the Grinch has a jumble of plans to ruin Christmas, none of them working. Of course, until he has the brilliant idea to pretend he is Santa. This is the part of the movie where we meet our new favorite character, the reindeer. The Grinch needs a reindeer to guide his sleigh, or he wouldn’t be Santa, but this reindeer is the only reindeer he could catch. The Grinch is just too silly to catch any muscular reindeer for his sleigh. Sadly though, we see the end of our jolly reindeer as he leaves to care for his family, just fifteen minutes after. The Grinch, after losing his trusty reindeer, gives his dog Max some reindeer antlers and they set off to steal Christmas. This goes on to be an extensive montage of the Grinch using his many contraptions to steal any remnants of Christmas from the houses of Whoville, and surprisingly is quite enjoyable to watch. But of course, it all comes to an end when the Grinch is captured in the little Who’s Santa trap, and the Grinch has to lie his way out of it. The Grinch contemplates all of what he had done, but continues to go home with all of the Whos presents. They wake up the next day, and the little Who takes the blame for the presents missing, but that doesn’t matter. All the Whos still have the Christmas spirit in their hearts, and sing away their sorrows. This causes the Grinch’s heart to grow, and the movie comes to an end with the Grinch eating at his first Christmas dinner. Overall this movie was pretty good, maybe not the most moving movie of all time, but a lot of the scenes were just enjoyable to watch, as they did a brilliant job with ideas and animation in the film.